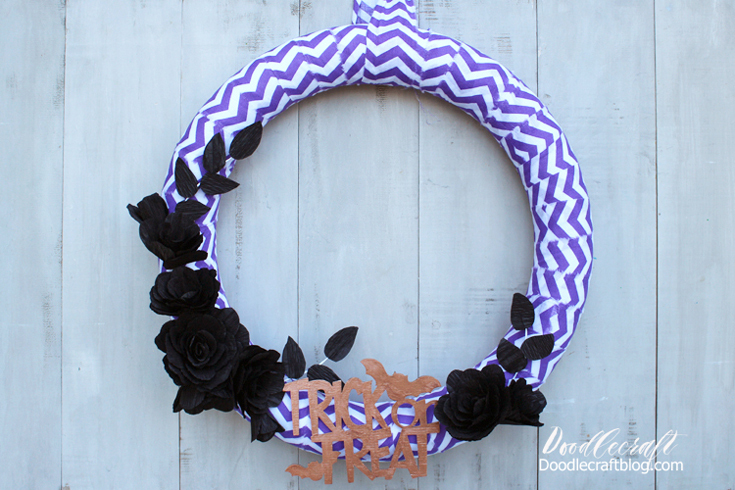 Doodlecraft: DIY: Crepe Paper Roses Wreath! 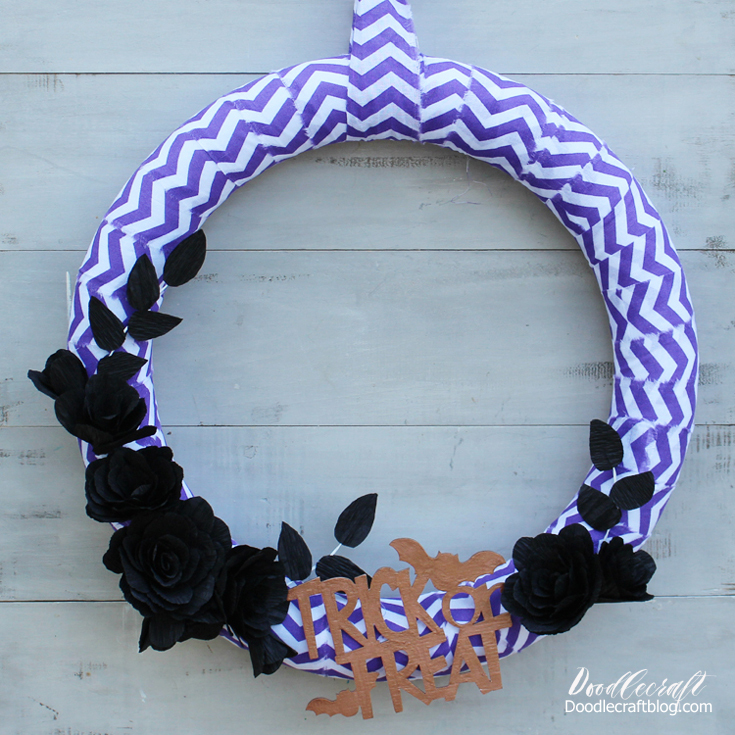 DIY: Crepe Paper Roses Wreath! This posted on Darice's blog last month--supplies received from Darice. If you are a business or buying in bulk, check out Darice. If you want to make this yourself, check out Consumer Crafts. Halloween is my favorite holiday. I love the orange, black, purple and lime colors. I love candy. I love costumes. That smell in the air, the colors of the Autumn leaves, and love cute decorations. 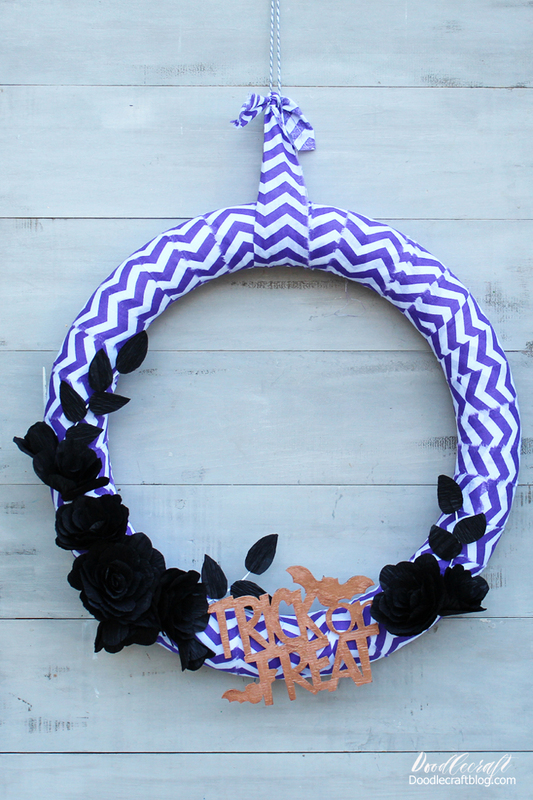 Let's make this cute wreath now! Rip the fabric into one inch strips. I love the ripped and frayed edge look. Then hot glue each strip and wrap it around the wreath form. Until it's completely wrapped. This idea could be adapted for any other holiday too! Cut strips of 1 inch wide crepe paper and fold each strip until it's about 2 inches tall. Then cut the entire stack all at once. Cut a petal shape. Each rose needs about 25 petals. Take one petal and curl it into a tube. This is the center of the rose. Then add hot glue to the base of a petal and wrap it around the center piece. Continue adding petals by setting it on it's face and adding petals to the back. Then make lots of roses! Make them a variety of sizes. To make the leaf, get some floral wire and fold it in half. Cut leaf shapes out of the crepe paper in the same manner as the petals. Sandwich the wire between 2 leaves and hot glue them in place. Alternate the sides the leaves stick out on. Then arrange the roses and leaves to your liking on the wreath form. Then hot glue them in place. 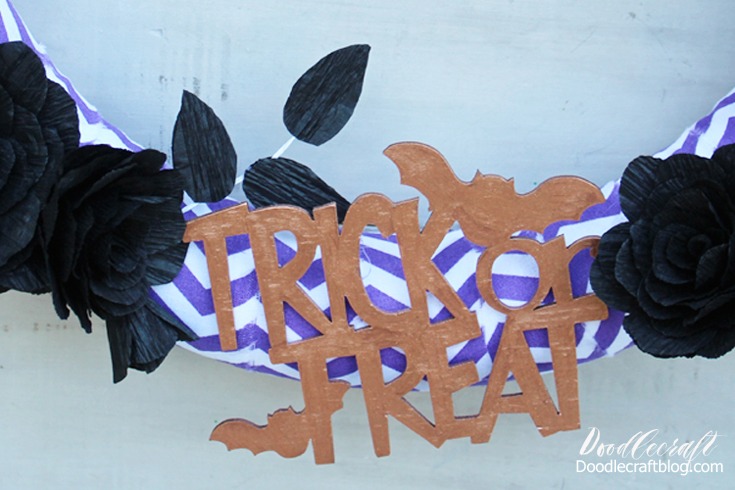 Paint the trick or treat sign with copper metallic paint and glue it on the wreath. Check out these crepe paper flowers too!